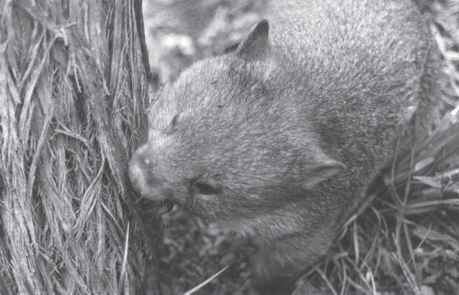 Brown GD (1964) Thermoregulation in the common wombat (Vombatus ursinus) in an alpine environment. In Thermal Physiology. (Ed JRS Hales) pp. 331-34. Raven Press, New York. Brown G and Young G (1962). Wombats - amiable native lawnmowers. Australian Natural History 20, 279-83. McIlroy JC (1973). Aspects of the ecology of the common wombat, Vombatus ursinus (Shaw, 1800). PhD thesis. Australian National University, Canberra. Wells RT (1978). Thermoregulation and activity rhythms in the hairy-nosed wombat Lasiorhinus latifrons (Owen), (Vombatidae). Australian Journal of Zoology 26, 639-51. Wells RT (1989). Vombatidae. In Fauna of Australia. Mammalia. Vol. 1B. (Eds DW Walton and BJ Richardson) pp. 755-68. Australian Government Publishing Service, Canberra.